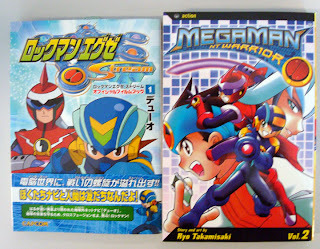 Rockman Corner: Unity Auctions: Comics! That's kind of random for them to pair up those two particular comics/mangas together... I guess they just did it since they were both EXE related. Bah, not enough community points to bid. :( I'll start my collection later. lol, vol 2? That's kind of random, why not vol 1 or the whole set? Probably donated by someone, just what they had on hand. Of course they'd group them together since they're both EXE.